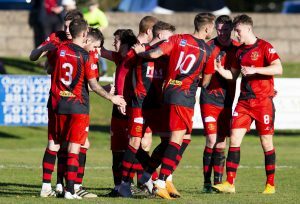 Annan returned from their second successive 500 mile round trip to the highlands with an important victory over Elgin City and the three points gained to push Annan into third position following Clyde’s home defeat against title contenders Peterhead. Peter Murphy once again made wholesale changes to his line up with Jonny Jamieson and Scott Hooper being given the starting places in front of Alex Mitchell and Kyle Bradley and with Tommy Muir replacing Chris Johnston up front. The foundations for the victory were laid in the first half when Annan went toe to toe against an Elgin team who were sitting on the same points and it took a brilliant Owen Moxon’s strike in 35th minute to separate the teams. It was one of the few moments in the game in where either team really tested their opposing keepers but it was a goal that both Annan and Moxon savoured. It was ex Annan player Rabin Omar who had the first real effort in the 11th minute when his shot took a deflection for a corner kick, this was followed in the 19th minute by a Chris McLeish effort for the home team which went narrowly past the post. Minutes later Annan were dealt a blow when Swinglehurst sustained an injury and had to leave the field after sustaining ligament damage to his right ankle, the injury resulted in the Annan defender being replaced by Ayrton Sonkur. As the game approached the 30 minute mark Annan were starting to cause problems and Lewis Strapp’s low 30 yard effort effort was confidently saved by Kyle Gourley. Then came the match decider when Annan broke down the left flank with the impressive Lewis Strapp slipping the ball into the path of Moxon who took a couple of paces forward before unleashing a brilliant 30 yard shot which gave Kyle Gouley in the Elgin goal absolutely no chance. It proved to be the winning goal. Elgin started the second half promisingly forcing Annan to defend, Shane Sutherland tested Jonny Jamieson in the 51stminute with a low shot which the Annan keeper confidently saved. This was followed almost immediately with a Ross Fergusson effort which went narrowly past the post. Rabin Omar then tried his luck with a 35 yard effort which flashed past the upright. Aidan Smith was introduced in the 70th minute replacing Tony Wallace and Elgin brought on Craig Beattie for Greg Morrison as both teams attempted to gain the upper hand. As the game entered the final stages of the match Elgin pressed forward in an attempt to save the match but it presented Annan with a couple of opportunities to seal the match, the first if which fell to substitute Max Wright who cleverly weaved his way into a scoring opportunity only to see his low shot beat the keeper but the ball struck the base if the post, this was closely followed in the 85th minute when Tommy Muir had a great opportunity to but he appeared to have too much time and he made a hash of the opportunity when a goal appeared the likely outcome. As the match entered injury time Annan faced an anxious moment in the 4th minute of time added when Elgin won a freekick on the edge of the box, Shane Sutherland stepped up and send in a well directed free kick to Jamieson’s top right hand corner but the Annan keeper was well up to the challenge tipping the effort wide of the post. It was a finely balanced match with Annan well organized defensively and limiting Elgin to very few opportunities and the victory after a long journey was reward for their efforts and keeps Annan in a promising position. Annan Athletic – Jonny Jamieson, Scott Hooper, Lewis Strapp, David Wilson, Owen Moxon, Steven Swinglehurst ( AyrtonSonkur 20 min), Scott Roberts ( Max Wright 77 min) , Ryan Sinnamon, Ross Fergusson, Tommy Muir , Tony Wallace (Aidan Smith). Subs not used Alex Mitchell GK, Chris Johnston, Kyle Bradley, James Creaney. Referee – David Lowe ​Assistants – Callum Spence and Barry Dickson. It was a day when the pace setters Peterhead and Edinburgh City maintained their impressive start to the season with Peterhead defeating Clyde 3-1 at Broadwood and City recording a 1-0 victory over Stirling Albion. Albion Rovers were defeated 3-0 by Queens Park in the Glasgow derby and Cowdenbeath defeated Berwick Rangers 3-0 with Berwick having 3 men sent off.